Indian diamond beaded jewelry is reminiscent of beautiful designs which showcase the brilliance of diamonds along with beads of gemstones. Diamond beaded jewelry is created with one central pendant and two or three smaller brooch pieces strung along with different strings of gemstone cut in beads. These gemstones are ground and polished on the machine and then a hole is made across them. They are then strung on silken threads according to their size, color and weight. Depending on the design either a solid color or a mix of gemstones is utilized to create Indian diamond beaded jewelry. Indian diamonds are also available in uncut form and are increasingly popular in regal style jewelry. These uncut diamonds are used to create unique designs with the base metal like gold or platinum and silver are used to create a rim around the uncut diamond. Since the shapes of these diamonds are different from each other an interesting combination of gemstones is created with their use. The central pendant or pieces are strung along on pearls in cream or pink. These are available in strings of three, five or seven and are commonly known in India as the teen lara, panch lara or sath lara, which means strings of three, five and seven. Apart from this, Indian diamond beaded jewelry is available in pieces used to adorn the wrist, as an earring or armband and even waistbands. The wrist cuffs are created with different vertical gold and diamond lines which are strung together by six or more gemstone beaded strings. The most common colors utilized in Indian diamond beaded jewelry are emeralds, rubies and sapphires. The diamonds are strewn across the gold pieces whereas the complementary gemstones provide a shiny base and frame to the diamonds. Where gold and silver are used to create solid and inflexible basis for showcasing diamonds, the use of beaded gemstones and pearls allows the craftsman to create a more flexible and shapely jewelry piece. 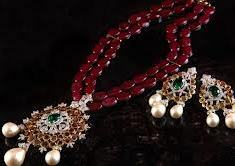 Long and thin strands of gold chain can be interwoven with diamond balls and framed with sapphires and ruby. Large pearls can be strung on silk threads and a beautiful diamond and Pearl pendant can hang from the center. This design is replicated for earrings also where the diamond piece showcased in the center and beautiful beaded pearls or gemstones hang down from the earrings and cascade the neck of the woman who wears them. Another interesting and unique design for diamond beaded jewelry is created in the form of earrings. Hoop earrings are very popular in India and strewn with different uncut diamonds and gemstones beads. These may be created out of the nine popular stones which include sapphires, ruby, coral diamonds, pearl and turquoise among others. These gemstones are said to affect the blood group and temper of the user and are highly prized for their soothing and unique qualities. With the amazing ready-made variety of Indian diamond beaded jewelry you’re sure to find something that meets your personal tastes and budget.